We found everything we needed in the apartment. Everything was very clean. The kitchen was equipped with everything and the bathroom was spacious and clean. At the same time, the pool was awesome and the view from the balcony was wonderful. Fairy-tale view, great studio. The owner, mr Nakas is a very pleasant person, permanently concerned with our stay and comfort. He also offered us a welcome gift: a tour in the Geny Bay with his own boat . This has been a wonderful experience and we would be happy to return. Many greetings from Romania! Away from the crowds of Nidri is this family oasis. Not easy to get to, but definitely worth the drive. The view of the whole bay is spectacular, we wished we could stay longer. Lovely friendly owners also send a map of the location to make it easier for us. Would definitely go back. First of all...the owner and his family are a delight on this island. We felt well there and they helped us with any question. The view from the balcony is beautiful. Just be really clear, the street to go there is rough. If you r scared of driving car, the whole Island is nothing for you. We thank the nice family and wish you all the best. Dimitris the host went out of his way to make us welcome. 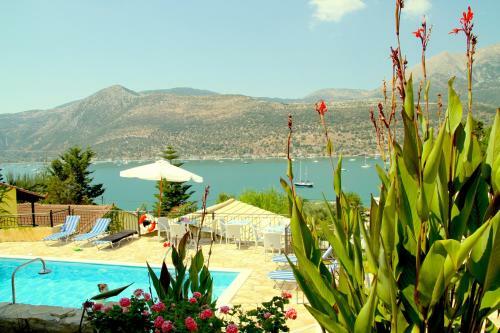 Wonderful stunning views from the apartment over the bay and mountains opposite. Equipped with everything you need really as we generally only slept there. Dimitrios, our host treated us like family and in fact we and other guests were invited to celebrate and share in his daughter's birthday with a beer, some nibbles and birthday cake. Very enjoyable. Everything was pleasant, peaceful and clean. Warm hospitable people. Nothing seemed too much trouble. Desemi beach is close by and one would do well to listen to Dimitrios's restaurant recommendations. Dimitrios emailed us a helpful map as the last part of the road is a dirt track and the property is not the easiest to find...but we'll worth it. Beautiful view with excellent room. The pool was lovely to come back to and have a swim at twilight. Dimitri and his family were fantastic and made our stay very enjoyable. We enjoyed every day at Armonia. 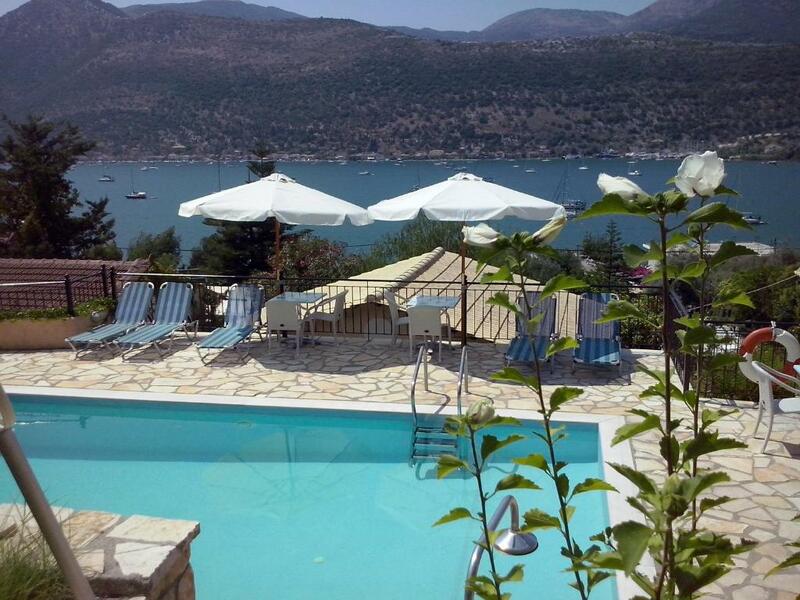 Stunning view, quiet place, all facilities you need and a very nice owner! The boat trip was a bonus and we spent wonderfull time. The host, Dimitrios, is simply amazing. Generous, helpful and a very nice person. We'd love to come back! Dimitrios is the best and most warm-hearted host anyone could ask for. He knows everything on the island ,has recommendations on food, wine production, boat rental , car hire , you name it. We felt like family during our 10 days spent there. He even offered to give us his scooter for a day,not to mention special favors he did for us as his guests. Lovely view of Vlycho bay, rooms and panorama in reality just like in the pictures,even better. Accommodation in a nice quiet bay,far from noisy crowded ultra-touristic places, you can always enjoy the pool, perfectly clean. There are many supermarkets around, one is a few hundred meters away. Would go back anytime!!! 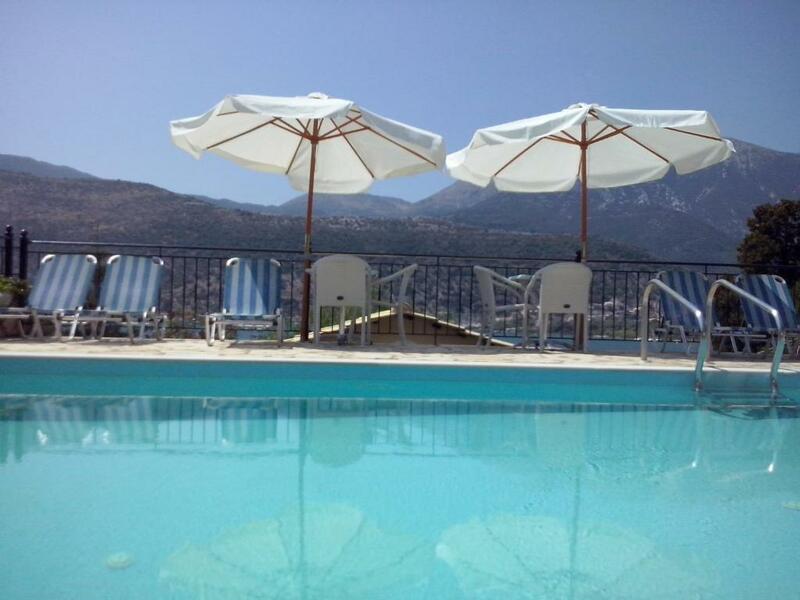 Lock in a great price for Armonia Nakas – rated 9.6 by recent guests! 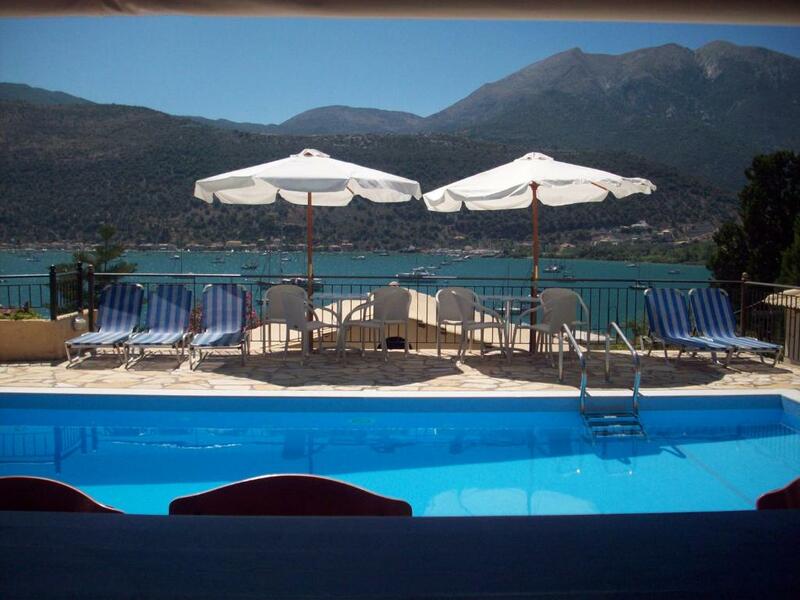 Located in scenic Geni in Lefkada, 1.9 mi from the sea, Armonia Nakas offer self-catered rooms with furnished verandas overlooking Vlycho Bay. A swimming pool is available. All air-conditioned rooms feature a well-equipped kitchenette with a fridge, cooker and dining space. Each includes a seating area with elegant sofas. A TV and DVD player are standard. 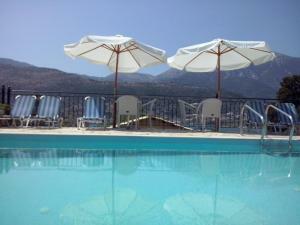 Guests can relax in the pool area that offers free sun loungers and umbrellas and has panoramic views of the Ionian Sea. Local taverns can be reached within a distance of 1.9 mi. Scenic Nydri Village with many fish taverns and cafés is just 3.1 mi away. The lively city of Lefkada is 12 mi away from the Armonia Nakas. Aktion Airport is 16 mi away. 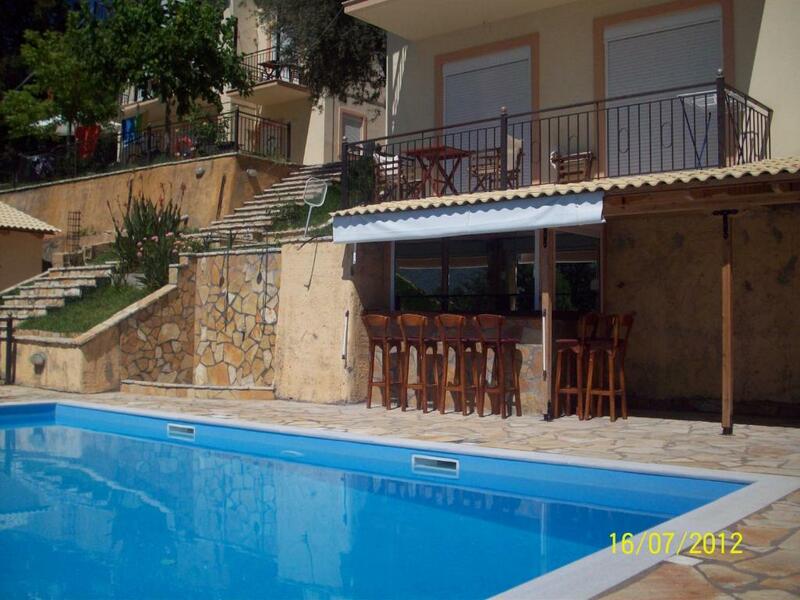 This property is also rated for the best value in Yénion! Guests are getting more for their money when compared to other properties in this city. When would you like to stay at Armonia Nakas? 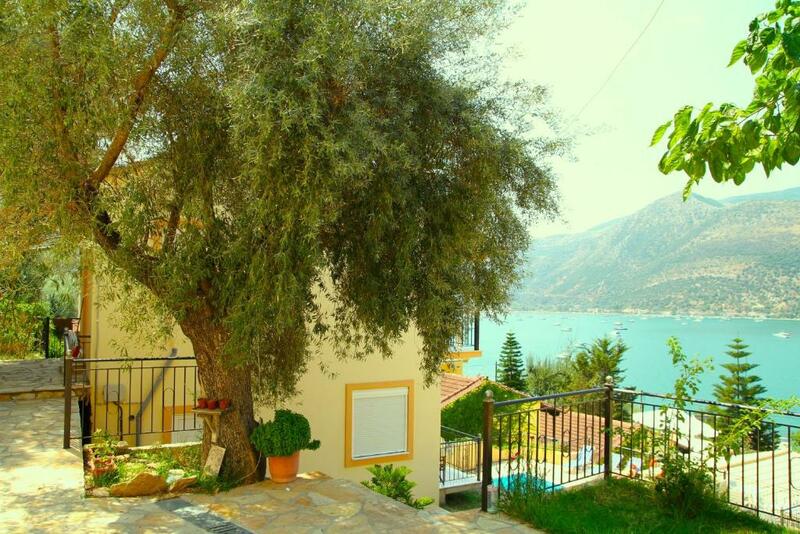 Bright and air-conditioned studio with a well-equipped kitchenette, TV and DVD player. This double room features a balcony, DVD player and air conditioning. This double room has a balcony, dining area and kitchenware. This double room has a balcony, DVD player and tile/marble floor. House Rules Armonia Nakas takes special requests – add in the next step! One child from 3 to 12 years is charged EUR 10 per person per night when using existing beds. Armonia Nakas accepts these cards and reserves the right to temporarily hold an amount prior to arrival. Please note that the last 1,150 feet to the property is a relatively smooth gravel road. Please note that full payment is expected on arrival. Nothing, but I would say that you'd probably want transport to get the best from this location and island. (Cars and bikes are readily available to rent locally, Dimitris can arrange this). Also bear in mind that it's self catering, so if you're used to 5 Star hotel luxury and constant service you're on the wrong page. This is about quiet beauty and simplicity, which suited us perfectly. This is Greece at its best. Absolute beauty with complete simplicity. Everything you need, nothing you don't. Armonia Nakas is relaxed, clean, well run and perfectly positioned. The pool area is perfect and all the apartments are immediately adjacent to it. The host, Dimitris, is the nicest and most kind person you could ever wish to meet, nothing was too much trouble for him and this was the jewel in the crown on our holiday. The location could not be better, very quiet and relaxing. It's stunningly beautiful in itself, but also well placed for visits to other islands via the ferry in Nidri, just the other side of the bay. We went to Kefelonia (Where Captain Corellis Mandolin was filmed) for the day which was superb, and from the same location we've visited Meganisi. You simply cannot get it wrong, everywhere you go is utterly gorgeous with island views over the Aegean sea. We used a scooter for all of our travels which Dimitris helped to arrange a a good price. This was perfectly suitable for getting us around including across on the ferry to Kefalonia and Meganisi. If bikes aren't your thing, cars can also be rented very reasonably. The best beaches I have very seen are on the Western side of Lefkada, so if you're not inclined to travel to other islands, don't worry! It's all here. There are 3 restaurants within a couple of hundred meters, and a shop. I've added 3 pictures taken at he property, one at the local restaurant and one from the ferry. We very much look forward to our return, which will almost certainly be in 2019. The acces road is not the easiest, especially for a less experienced driver, as you have to go up the mountain on a narrow path. But the view is well worth it! Internet occasionally slow. Could have done with 2 pans for cooking. The studio has anything you could need. The view is fantastic and Dimitri is the best host ever, very warm and friendly, always there to make sure you have everything you need. We felt like home, he took us on a trip with his boat, even helped organise a birthday party. The pool was always perfectly clean. And one advice: try his restaurant recommendations. An unpaved road uphill leads to the apartment. A car is needed to go to the village, as there's no path down from the apartments to the main road. However, you can walk to the village (500 meters), but it's pretty steep uphill. 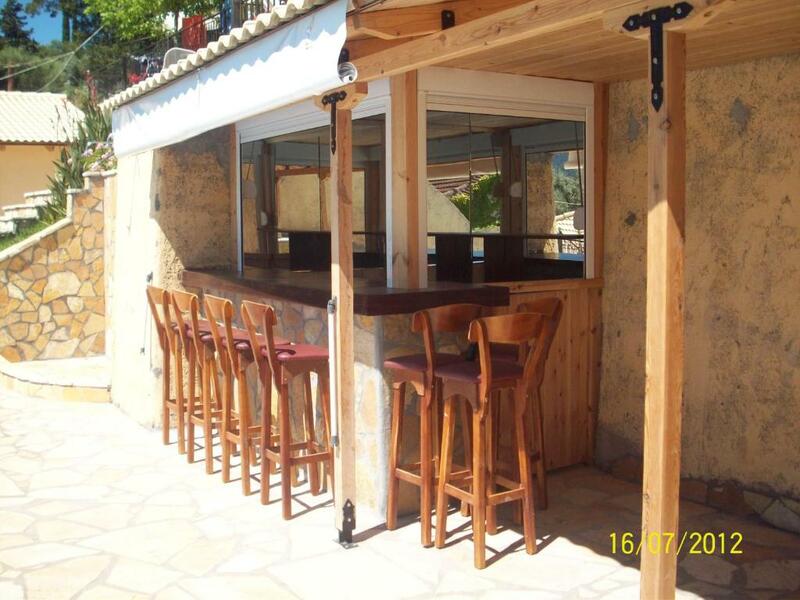 Great cottage with amazing view on the bay in a quiet area, but only a few kilometers from the lively town of Nidri. Very private (I had cottage nr. 2). Good size pool with sunbeds and umbrellas. Dimitri is a very kind host and gives you a warm welcome. A little paradise!